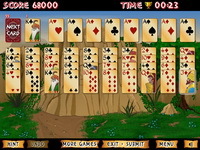 Addictive solitaire free game in new interpretation. You are in the airport and are waiting for your next flight. The best pastime is the solitaire game. This classical and popular patience is known as double Klondike because you are playing with two cards decks. Similar game to Freecell, except you have to build your cards on the tableau in suit. Try to solve all 3 levels for your high score. Move all the 52 cards to the 4 foundation piles up in suit from A to K (2 top left and 2 top right places). The 4 free cells can hold any card (middle top). You can build cards down by suit on the tableau (this is the difference with the classic FreeCell game). Make combinations of 3 or more cards on the grid. Create combinations of the same cards (for example Q Q Q) or cards in ascending or descending order (for example 5 6 7).